This is a highly approachable, general information book for the novice who wants to learn more about occupational therapy. It defines and describes the scope and universe of occupational therapy practice in a readable, enjoyable way. It addresses the history and evolution of the occupational therapy profession, as well as the changing roles of the occupational therapist (OT) and occupational therapist assistant (OTA) in the health care environment. In addition, the book presents the general educational and licensure requirements for the OT and the OTA. The professional code of ethics and scope of practice, as well as different practice settings, are also addressed. local, state, national, and international levels, to include Canada, Australia, New Zealand, and Guam. Additionally, Dr. Marcil regularly teaches distance education courses on patient-therapist interaction and working with the terminally ill at the University of Indianapolis. A Fellow of the American Occupational Therapy Association (FAOTA), Dr. Marcil has served the Virginia Occupational Therapy Association (VOTA) as Recording Secretary, Vice-President, and President and continues to participate in the promotion of the profession as a speaker, author, and as President of the Board of Directors of RiverHouse Hospice. A recent acquisition to the faculty at TCC, Dr. Marcil has come full circle and has returned to his roots in teaching, grooming, and mentoring future COTAs. 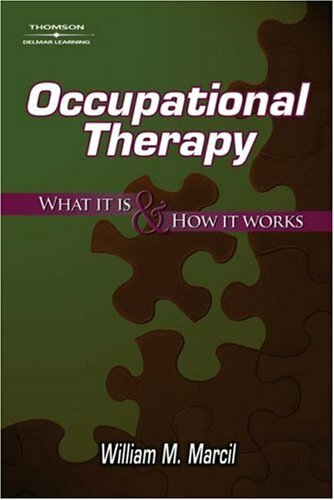 What it Is Introduction: What the Heck is Occupational Therapy, Anyway? How does occupational therapy fit into the health care team?